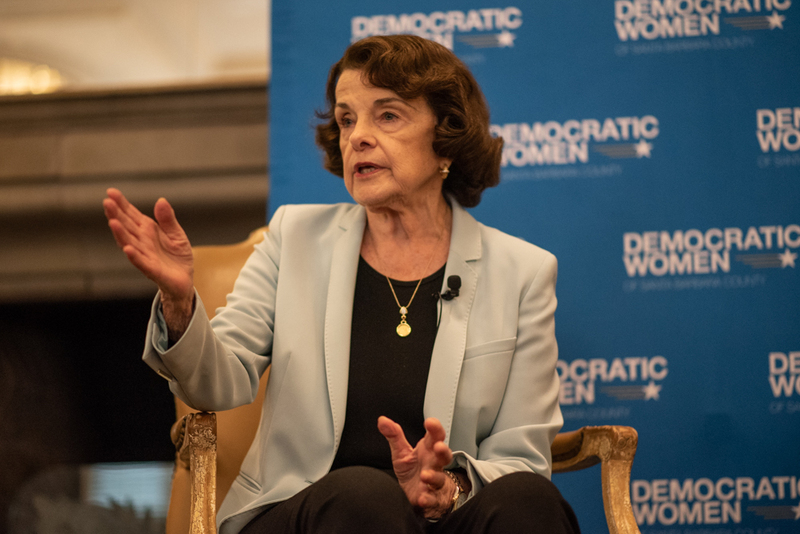 Senator Dianne Feinstein landed in Santa Barbara on Sunday to talk with Democratic Women of Santa Barbara County about Brett Kavanaugh's Supreme Court nomination and other topics. Jerry Brown, once the political avatar of youth and new ideas, left the governor’s office this week with an intriguing commentary on the most important quality of elected leaders: experience. The 80-year-old Brown, not only the oldest governor ever but also the youngest since the 19th century, came to office back in the disco era with a young man’s contempt for geezers in government. Today, he says he failed back then to appreciate and honor elder wisdom. Brown pointed to Joe Biden, the 76-year-old former vice president and possible 2020 presidential candidate, as a good example of his wizened theory. Senatorial, Um, Courtesy: Senator Dianne Feinstein, another member of the octogenarian brigade, told Washington reporters she also likes Biden for president because the former veep would bring a “level of experience and seniority” to the White House. Not great news to Senator Kamala Harris, Feinstein’s California colleague, who’s also likely to run, after two years in her current job. Harris, sniffed DiFi, “is brand-new here.” Ouch. Grandma of the House: Nancy Pelosi, another in California’s all-star lineup of elders, historically reclaimed the Speakership of the House a few days ago at the age of 78, amid a wave of media paeans to her prodigious political skills. It called to mind a small but telling incident illustrating her old-pol street smarts and sensibility. In 1987, days after winning her first race for Congress, Pelosi was driving to a thank-you luncheon for supporters, accompanied by a reporter interviewing her for a post-election column. Passionately making a point with her characteristic wide-open eye contact, she made a wrong turn and suddenly was heading the wrong way on a busy avenue on San Francisco’s Westside. Realizing her mistake, the future Speaker lurched back to the right side of the road, by which point the newshound was whimpering, curled in the fetal position in the passenger seat. His column appeared a few days later, with a throwaway item about cheating death with Pelosi at the wheel and a kicker offering tongue-in-cheek advice, suggesting that her “first official act should be to hire a driver.” Incensed at being portrayed as unable to navigate her district, Pelosi phoned up to chew him out for taking a cheap shot. Fast-forward 20 years: A few months after becoming the first woman Speaker, Pelosi came to Santa Barbara for a fundraiser at the home of the late Betty Stephens.